How many times have you had the thought of whether the donations you make are being used efficiently? Nonprofits across the globe are now turning to data to make the processes much efficient and bring about transparency. They store and analyze data to not just improve their own logistics but also to be able to target potential donors the right way. The data is available in the form of data stored in donor databases, blog posts, and social media posts and so on. 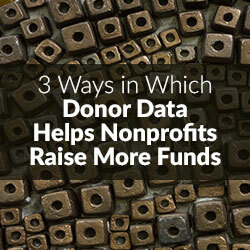 All this data offers a gold mine of insights for the nonprofits. NONPROFITS’s today are talking about when and how to tap into this data and what to do with it. They want to know how to sort, analyze and manipulate the data and put it to use. By leveraging analytics tools and solutions to analyze the wealth of donor information, Nonprofits can gain powerful insights into their donors’ behaviors and needs. Better retention/reactivation strategies: Nonprofits can develop better retention/ reactivation strategies if they have access to donor data, intelligent data mining can help in generating more donations through reactivation and retention than trying to generate new accounts. For Example. CRY foundation which is focused on child empowerment has donor data across continents. Understanding the mode of communication to which the donor responds best, they have been able to increase their donor retention rate every year. This in turn have only aided them in ensuring a deeper impact every year on wards. Better marketing decisions: Leverage history and response behavior to make better targeted marketing offers to donors increasing the chances of success. Nonprofits can connect their donor base and put up creative appeals intelligently better offers and increase the donation in response for their appeals. Better donor experience: If we know a certain nonprofit donors talks better to a certain agent – try and route calls to that agent. If they are online – display information relevant to them based on their web traversal history. Monitor social postings, and identify the opinion leader in a pack of friends to determine where to make an appeal. This will increase the awareness as well as increase donation. Another method to better donor experience is learning from what Akshaya Patra an India based nonprofit organization that focuses on providing mid-day meals for about 2 million Children in ten states of India. They collect data on feedback from Children in order to ensure high quality of meals every day. This data can be passed on to potential or current donors to ensure that their donation is making a difference to the lives of the children. Even though just two examples have been mentioned in this article many other organizations that are also turning towards data to utilize resources effectively, save time & costs, and thereby increase efficiency of operation tremendously. Even though many organizations are not too optimistic about depending on data for driving their decisions, organizations that have done so has seen great improvements. Dheeraj Pandey is a Senior Consultant at IQR Consulting, a provider of data analytics solutions to retail, non profit and financial services firms. He provides analytics, business intelligence and quantitative research for different industries, and his research on consumer behavior has been selected for presentation at several international conferences, including INFORMS (The Institute for Operations Research and the Management Sciences). Pandey’s main areas of interest include behavioral sciences, donor behavior, data modeling and social media marketing.